High-quality dental bridges at the best dental clinics in Iran offered at decent prices. Are you looking for affordable dental bridges abroad? you’re not alone in this. Each year, thousands of people are heading off to various countries to get their dental treatments done at a better price. 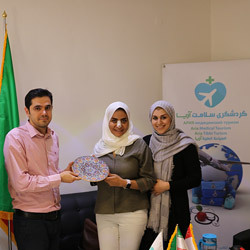 Some of them choose Iran over other destinations as they heard of the great expertise of Iranian dentists and the affordable cost of dental procedures. If you’re curious to hear more, this post depicts all you need to know about getting a dental bridge in Iran, including the procedure, costs, benefits, materials, recovery, and everything. Dental bridges, as the name suggests, bridge or fill in space between two crowns, implants or teeth. A dental bridge consists of two crowns or teeth and a false tooth in between. The false tooth, otherwise known as 'pontic', acts as a bridge, connecting the two adjacent crowns or teeth. A dental bridge consists of two crowns or teeth and a false tooth in between. 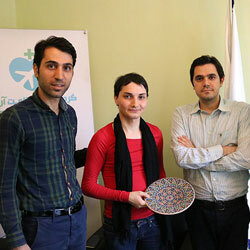 Why get your dental bridges in Iran? With the significant development of dental technologies and treatments, Iran’s turning into a reliable destination for foreign patients. The country boasts a community of professional dentists who have attended top dental schools and colleges in the UK, USA or Canada. In Iran, all hospitals and clinics are regulated by the healthcare system of Iran which ensures that they follow global standards of medical and dental practice. So, you’d be able to find well-equipped dental clinics in every corner of the country, especially every major city. Another factor reinforcing this growing industry in the country is the affordability of dental services like dental bridges. However, the low cost of such procedures does not mean that you’d be going through sub-standard dental practices or experiencing poor quality facilities and materials. The lower cost of living, weak currency, and lower salaries result in a lower cost of treatments in the country. For example, an average Iranian dentist's wage is one-tenth of an American counterpart. The same story is true with the rest of the workforce. Therefore, in Iran, you can save from 30% up to 80% of the money you’d have to spend on your dental procedure in your home country. The country boasts a community of professional dentists who have attended top dental schools and colleges in the UK, USA or Canada. Span space where the tooth is missing. 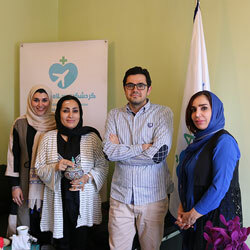 Dental bridge procedure in Iran: how it's done? To get your dental bridges in Iran, you’ll need to stay around 7-10 days in the country. A dental bridge is prepared and placed within 2-3 sessions. In the first session, the dentist prepares the teeth for receiving the bridge. To this end, the adjacent teeth, known as abutment teeth, are shaped by filing down. Then, the mold is made and sent to the laboratory. In the second session, the bridge will be placed and fixed on the teeth/crowns. Then, the bite will be checked and corrected if required. Depending on the type of the bridge, it will be secured in place using different supports. This will be explained more precisely in the next section. 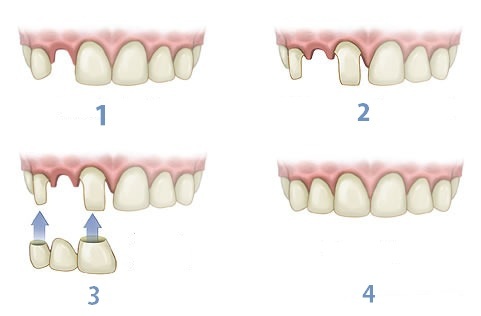 See the four steps of a dental bridge procedure in Iran! Dental bridges come in four main types: traditional, cantilever, Maryland, and implant-supported. These bridges are made of porcelain-fused-to-metal or ceramic. They are the most commonly used bridges. When using traditional bridges, the bridge is placed and cemented to the natural teeth which were prepared beforehand. They are durable and feel natural. However, when the adjacent teeth are not damaged, the dentist has to remove layers of enamel to create room for attachment of the bridges. This is regarded as the main drawback of traditional bridges. Cantilever bridges are made of porcelain or ceramics, just like traditional ones. 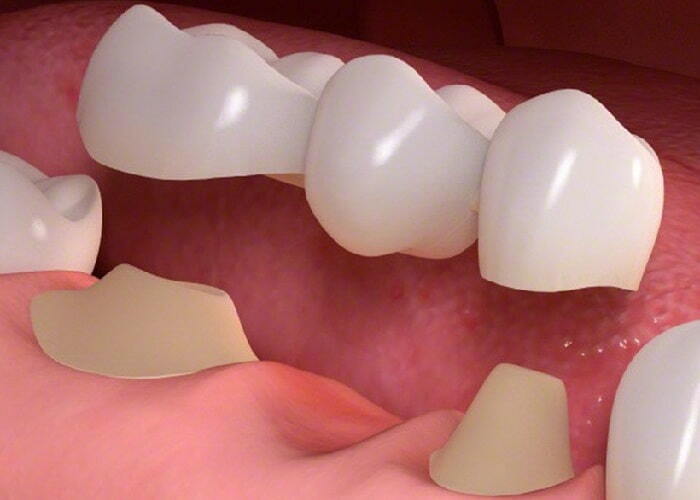 In these bridges, only one adjacent tooth in one side of the fake tooth is manipulated and trimmed. So, this option works for those who only have one damaged tooth with a gap next to it. Maryland bridges are made of porcelain, porcelain-fused-to-metal, or plastic. The false tooth is bonded to only one adjacent tooth using resin, metal, and porcelain wings. With this type of bridges, the adjacent teeth will not be affected and filed down. However, they’re not as strong as traditional and cantilever bridges, as the material holding the bridge may get loose under the biting pressure. When the adjacent teeth are missing and replaced with dental implants, the bridge is supported and secured in place by those implants. These bridges do not get loose easily and feel as comfortable as your natural teeth. To get this type of bridges, you first need to receive implants and then go for a dental bridge procedure. See the difference between a traditional bridge and an implant-supported bridge! Getting dental bridges in Iran can save you big money. A dental bridge costs from around $150 to $250 in Iran (including all the related fees). However, you’d have to pay from $500 to $1,200 to get a false tooth in the US. The same procedure costs from $500 to $1,000 (per tooth) in the UK. This cost only includes the price you need to pay for getting one fake tooth, excluding any anesthesia fee or else. Dental bridges vs. implants: which one is better? Both implants and bridges replace missing tooth/teeth. However, they do not bring the same advantages and disadvantages. While you can improve your teeth appearance and functionality by getting either an implant or a dental bridge, the situation would be different with each of them. A dental implant does not affect the surrounding teeth, and it can last for a lifetime. Bridges, however, impose pressure on the surrounding teeth. To get a dental bridge, the enamel of adjacent teeth would be manipulated. This is not desired by many, considered as a disadvantage. However, this procedure is way easier and cheaper than getting an implant. To get a dental implant, the patient needs to undergo surgery. The patient also needs to have sufficient jaw bone to receive the implants. Therefore, not everyone is the right candidate for this procedure. All in all, to determine whether an implant or a bridge is the right option for you, you need to consult with a dentist. 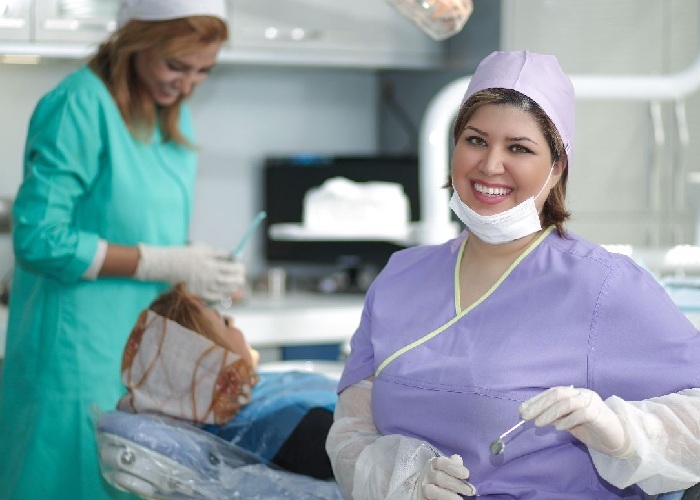 Bridges are fixed in place using local anesthesia. When the local anesthetic gradually wears off the area, the bridge feels comfortable in your mouth. After the procedure, you can easily chew and eat without having problems, but you also need to make some effective changes to your dental care routine. You should keep your gums and teeth healthy by brushing them with fluoride toothpaste three times or twice a day and flossing them almost daily. For doing the checkup and other professional services you need to see a dentist regularly. You can also ask your dentist about the routine care to make sure you are taking care of them fully and to prevent spending much of your budget again on solving the problem with a bad bridge. Keep your gums and teeth healthy by brushing them with fluoride toothpaste three times or twice a day. Your dental bridge can last for 10 years or longer If you take proper care. Only in some rare occasions, they may get loose or fall out of the position. For example, a dental disease may cause damage to the bone which is holding the teeth. As a result, the fake tooth may get loose. Is dental bridge procedure painful? The procedure is not painful as the dentist may apply local anesthesia if necessary, and to put the patient at ease. You won’t experience any pain after the procedure either. Will the dental bridge affect my speech? Dental bridges may feel a little bit awkward at first. However, this feeling won’t last for a long time, and you’ll be able to speak better than the time you had a missing tooth in your mouth. Will I have difficulty eating and chewing? There would be no difficulty regarding eating and chewing foods after getting bridges. However, your teeth may become sensitive to very hot and cold foods and drinks for some time.